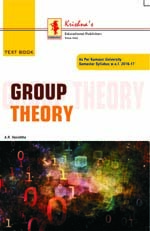 TB Group Theory (Kumaun) II Sem. Code: 1205, Language: English Publishing Year: 2017 Format: , Pages: 260 Writer: A.R. Vasishtha & A.K. Vasishtha ISBN: Width: 5"x8.5"